THE UNEMPLOYED EATER: Bummer Central: Earl's Gourmet Grub Closed in Mar Vista. But They're Having a Party! 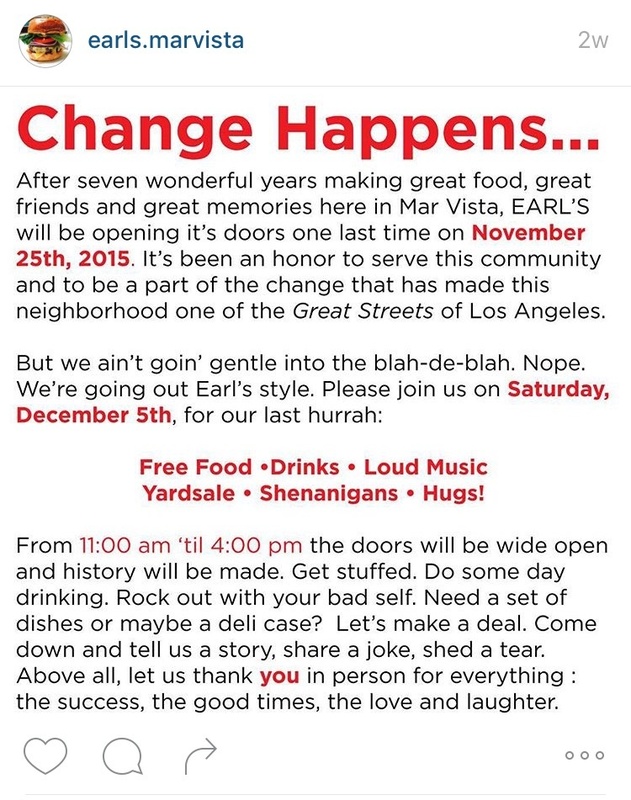 Bummer Central: Earl's Gourmet Grub Closed in Mar Vista. But They're Having a Party! While trying to figure out where to lunch the other day I came upon this horrible news: Earl's Gourmet Grub, a Mar Vista standout for the past seven years, had been closed for two weeks. This is certainly a loss for the neighborhood as Earl's dished out high quality, chef-driven breakfast and lunch at walk up and order prices. Their beloved Duck Hash, which I admired like a firstborn child, pictured above, will be especially missed. Although no reason is expressly stated, one can surely suppose it's the rising Mar Vista rent. Just a few months ago, another local lunch fave, The Curious Palate vanished in the night. MV simply isn't cheap anymore and it appears the affordable lunch spots in the neighborhood are learning that very quickly. If you want to say goodbye to Earl's, or, I don't know, want to buy their deli case, they're throwing a toodles party tomorrow, 12/5, from 11 am to 4 pm. As you can see in the Instagram post about the closure, they're encouraging loud music and shenanigans. 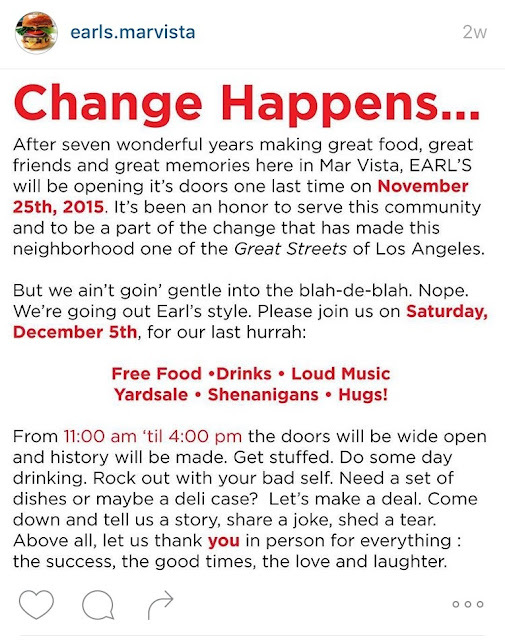 Oh, Earl's you were the bestest and we will miss you so. The counseling was just in time before any more of problems! Everything remains so good with Borrower! I am really glad that I chose them for my work! Amazing! This place is so special! Speaking of special, this is how our evening went. I met my buddies in the downstairs part of event space Chicago, which is more than just an average kind of bar with a lot of woodwork.